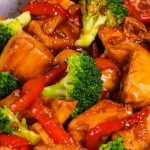 Honey Garlic Chicken is a super easy chicken recipe cooked in 15 minutes. Mouthwatering and tender chicken is coated with the most delicious 4-ingredient honey garlic sauce. Sticky, sweet and garlicky, the perfect weeknight chicken meal!